We don’t really go out of our way to save the planet, but my Mum and Dad did live through “The Great Depression”; Mum was pretty canny with the family funds while raising six children and Dad was a great producer of food from their two acre block. I was the sixth of the children, so he no longer sent produce and poultry to market, but I spent many hours avoiding the housework so happily stirring liquid manure, watering the vegies or picking peaches and plums for Mum to preserve a zillion ways. It all seems like common sense to me, so I definitely picked up a few habits and values along the way. Waste not; want not, stitch in time saves nine and all that. I recycled when recycling wasn’t fashionable and composted when my generation were throwing everything away. We took the cardboard to the cardboard recyclers, the aluminium cans and metals to the metal recyclers, the man up that dirt road takes beer bottles and wine bottles, but they have to be sorted by colour…all seemed too easy, really. I have also been following backyard, suburban, Permaculture principles for the past quarter of a century to create a home for my children, unproductive and productive family pets and beneficial insects as well as providing food, fun and aethetic gardens along the way. However, my pièce de résistance was a yard I have not owned for 10 years now. Much water under the bridge with a divorce, parents health needs, work, remarriage and a myriad of personal crises and ‘just life’ clouding my early clarity of purpose. 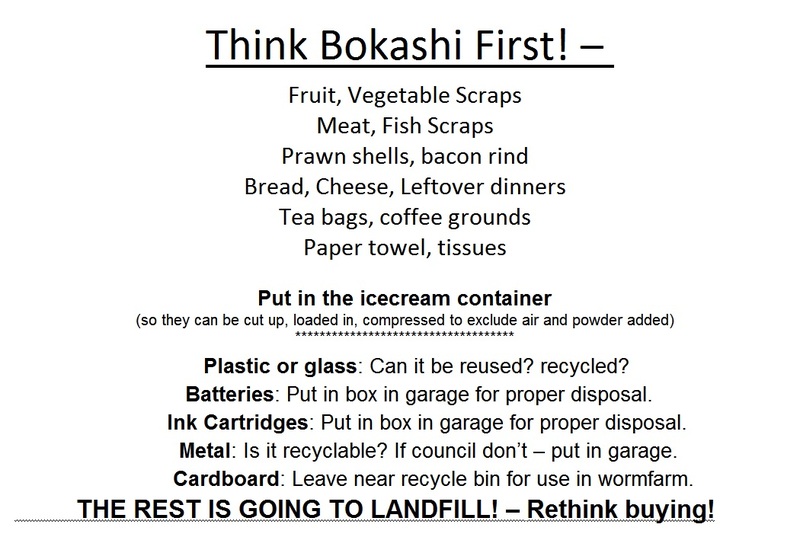 One project sometimes flows onto others and just brings your world back into focus.So, once I found Bokashi last year, there was a sudden great increase in the proportion of our rubbish that was getting recycled in our suburban home. I already put most newspapers and cardboard aside for use in Permaculture sheet mulch gardens (lasagne, no-dig). We just put technology and chemicals aside in the garage until our local council calls a day when we can take these in. If we miss one, there will always be another soon. 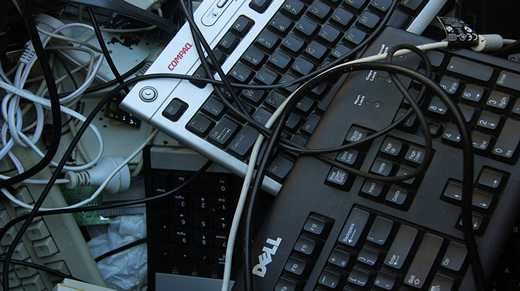 Batteries and printer cartridges eventually find their way to the participating shops’ recycle bins (I can’t believe we would ever just throw them in the bin; honestly us humans sometimes act like it is someone else’s responsibility to make sure the world doesn’t get contaminated). Our council collects plastic waste, paper, cardboard, steel cans, etc in a fortnightly pick up. There is also a green waste pick up on the other fortnight, but we rarely have a lot to put out. We have been composting fairly unsuccessfully the past few years as our heart hadn’t really been in it; the dog (and the weeds) get into on-ground compost and the tumbler we bought off E-Bay just seems to take so long and gets so heavy to turn. Quite often my hubby slips a few catchers full of clippings in the ‘green bin’ just because he thinks there is way too much already. When I go to create a new garden….there is never enough. I ressurected my wormfarm which my inexperience had let ants take over a couple of years before. It now sits happily on our back deck with a container full of water under each leg. I just fill up the containers every so often. If ants want in they’ll need to swim in. I also leave the tap on the bottom turned a little on any excess liquid can just run out into a bucket, otherwise it could flood. Some people just pull the tap out, but I think that leaves the wormfarm a little bit too open to visitors. 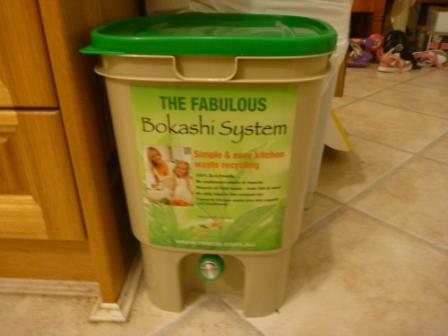 The week we started Bokashi, our kitchen tidy bin had nothing in it but plastic bags and cling wrap. When you do one thing, you often start to get angst about stuff that you hardly noticed before. We used to fill up a kitchen bin a couple of times a week but, all of a sudden, we had hardly a thing to put out for council collection. The plastic I was conscious of, but consciously chose to leave that project for another day. I got on my trusty computer and made up a sign for the lid of the bin. That was all that was needed as far as educating the family on what to do. Everyone happily plonked their scraps in the container provided and I just added them to the bucket at the end of the day, added some Bokashi bran and pressed them down to exclude air. So much easier than having a scrap bucket that can’t have bread, citrus, onions, fungus, etc and which has to get out to that compost bin or the kitchen aromas can become less than pleasant, very quickly. So far, so good. This Bokashi idea seems to meet my initial goals and then some. Wonder if it can get any simpler or cheaper or better?? My Bokashi Beginnings – someone was a bit excited! I stumbled on Bokashi less than 2 weeks ago, when I googled ‘kitchen compost’ and thought I was looking for a suitable hardware item. I went from ‘what the’ to ‘wow’ over a sceptical and dizzying personal research program. The more info I found the easier, simpler and possibly cheaper it got and the limits of the benefits to gardens, communities and … the planet seem endless. I looked at prices of ‘required’ equipment and EM-1 activated microbes (the powder you sprinkle on your scraps to commence the fermenting process – stands for Effective Microorganisms). I tried to think it through and did a bit more research. It was becoming a little daunting – with lots of online and youtube suggestions that you can add this and that, you can make your own powder in 50lb lots, etc. I just wanted something that didn’t stink in my kitchen so I could get back to not throwing out perfectly useful scraps. Then I found http://bokashiworld.wordpress.com/2012/02/09/it-can-be-done-bringing-home-bokashi-to-your-veggie-patch/ Suddenly this was easy as: Follow simple steps and throw just about anything in. It can be as cheap or as expensive as you want it to be. I ended up buying the commercial bucket (lets face it, my initial plan was to buy something nice-looking to keep in my kitchen also hubby encouraged me to spend the extra as I LOVE gardening), Jenny is very successful, on quite a large scale, with just a lidded bucket. Highly recommended reading! I chose to also buy the powder. But have recipes for making the base and activating the EM inoculant (in smaller than 50lb lots). Plenty of youtube instruction videos – you probably need to buy the inoculant to start though this goes a long, long way and is not costly (share the cost with a friend or two?). The commercial powder contains a mixture of ‘good’ microbes in a wheat bran (or similar) base. It’s light, smells just sort of fresh and is easy to use – grab a handful and sprinkle. So far, I have had NO smells (I’m only on my first bucket remember, don’t hold me to it). It won’t be in the kitchen once it is full and going through it’s ferment stage. I will be using a normal bucket for a second bucket and sacrificing the liquid as I went crazy and re-established my previously murdered worm-farm, too. My second bucket is going on holidays and, as I don’t have to worry about a bit of paper sucking up the liquid, I’ll be collecting all the meat, vege, cheese, bread, cofee grounds, etc, etc, etc scraps from 4 families, sprinkling with Bokashi powder and bringing home. Can’t wait actually! This seems so much more user friendly than worm farms and even traditional compost where my own family would have trouble working out what to put in. Once the scraps are fermented – in about 2 weeks, I could just dig a hole and bury it (in the yard, in the garden, in a box of soil). I will use it to get my compost pile going faster and also introduce some to the worms. I feel Bokashi just makes all the processes come together and the garden should just come alive. The fact that ferment doesn’t stink like rot is just a bonus so I can do this on the run, right where the scraps are created – in my kitchen. There’s people doing this that don’t care for gardening, just for waste reduction – giving it to the gardener down the road or the local community garden. Week 2 – I don’t know how I survived without Bokashi – guess I’m hooked!